Having invested in a pack of lean lamb mince, I began experimenting and I have to say, the results even blew me away. The meatballs were juicy and flavoursome and the accompaniments easy to make and bursting with the flavour. There are two amazing things about this recipe. The first is that it makes 36 meatballs, yes 36 meatballs!! That’s six whole portions at six meatballs per person. I used two portions in the recipe below and froze the rest (uncooked) to use at another time. The second great thing about this recipe is it’s quick and easy. You can basically accompany it with anything you fancy although the below combination really is a winner. If you make the meatballs in a large batch in advance like I did, it’s even easier. I was served this in some wholemeal flat bread pittas which are around 3sp each with a large fresh side salad for that extra bit of something. (6sp for meatballs, 3sp for flatbread, 0sp for harissa and mint yoghurt and 1sp for feta). In a large bowl add all of the meatball ingredients. Mix until well combined and then using either your hands or, if you have one, a meatball press (I got mine from eBay and it was really good value! ), form the mixture into golf ball sized meatballs, rolling in your palms until nicely shaped. Then take a large frying pan, spray with 1kal and on a medium heat, fry the meatballs until browned on the outsides. Remove from the pan and pop onto a plate. In the same pan, spray with 1kal and add the onion, peppers and Ras-el-Hanout (or alternative spice mix) and fry for 5-7 minutes until softened. Add the meatballs back into the pan and pop into the oven for 15 minutes so they cook through (if you don’t have an oven proof pan, pop them into a baking dish). If you are having the Sainsbury’s flatbread like we did, pop this in the oven for the last 7 minutes of cooking. While the meatballs/onions/peppers are cooking, prepare all the other ingredients and set out ready for assembly. Then remove meatballs from the oven and begin constructing your kebab. 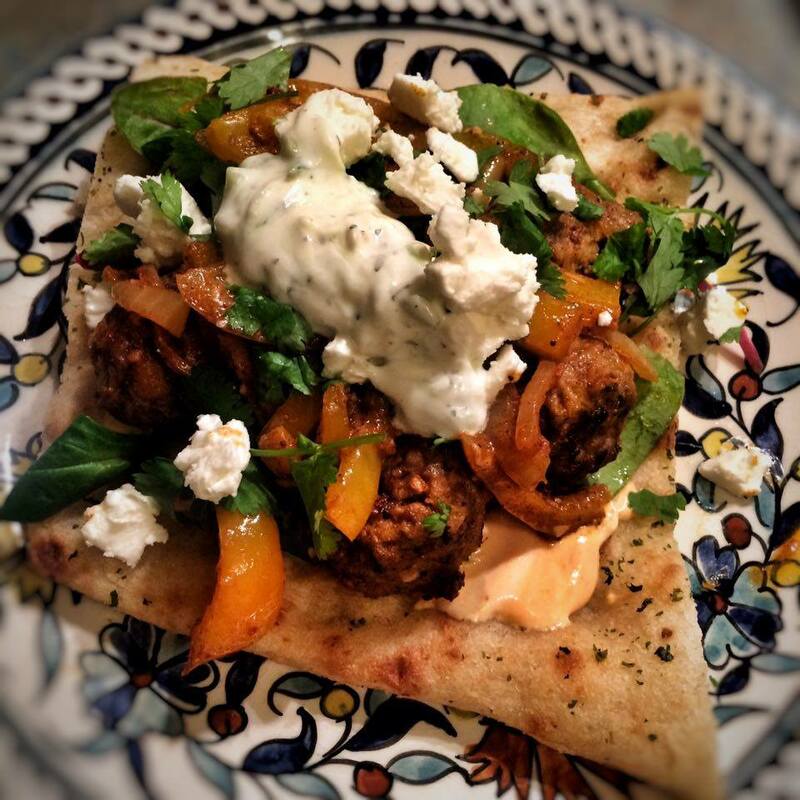 We had the flatbread open and then fill from the bottom, topped with harissa yoghurt, then salad leaves, then onions and peppers, then meatballs and coriander and then finally feta cheese and mint yoghurt. It was literally a feast for the tastebuds! Delicious!! I got distracted halfway through making the meatballs with my child’s bedtime and accidentally missed out the parsley and egg and I didn’t have a lemon for the zest but they still turned out great. The yogurts were so simple yet tasty. We served with asda seeded flatbreads and both really enjoyed. Had the gnocchi at the weekend and that was also amazing, thank you!